Receiving a death sentence verdict Executions are carried out by hanging, shooting in the back of the head or lethal injection. In many years there are several times more reported executions in China than the rest of the world combined. Even then according to Amnesty International: "Only a fraction of death sentences and executions carried out in China are publicly reported." The annual toll is not released and is treated as a state secret. These days many executions are carried out with a lethal injection as opposed to gunshots. Executions generally take place in specialized chambers or vans, away from public view. In 2009, the city of Beijing began using lethal injections in the execution of condemned prisoners instead of shooting them. In January 2008, the Chinese government announced it would expand the use of lethal execution and phase out executions by gunshot. Severe punishments have traditionally been regarded as a warning, summed by the old Chinese saying "killing a chicken to scare the monkeys." During the Cultural Revolution executions were often performed in public, and Chinese citizens were often forced to watch as "a form of solidarity with the people against the people's enemies." On August 30, 1983, 30 convicted criminals were executed in a sports stadium before a cheering crowd of 60,000 people. In the 1970s some executions were broadcast on prime time television. Even today there are mass sentencing rallies and public executions. There have been cases of innocent people being executed. Defendants who face the death penalty are often denied their rights. In one case involved a migrant worker who killed four people the ruling on his appeal was done by the same judge who made the initial ruling. A suspended death sentence is usually commuted to life imprisonment after two years if the person shows good behavior. This can later be reduced to 20 years or less with good behavior. In 2007 prisoners that received these “death penalties with reprieves” outnumbered prisoners that were executed. Studies seem to indicate that the threat of capital punishment does little to deter crime. The official position in China is that someday China will abolish the death penalty but that "conditions aren't right" to do so now. China executes more people than the rest of the world combined. San Francisco-based human-rights group Dui Hua Foundation estimates that 4,000 prisoners were executed in 2011. Amnesty International no longer reports execution data from China, but believes the figure is "in the thousands." By comparison, there were 43 executions in the U.S. in 2011, according to Washington nonprofit organization Death Penalty Information Center. According to Amnesty International of the 2,400 execution performed in 2008, 1,700 were in China. Dui Hua estimates that 5,000 executions were carried in China in 2009, down from 7,000 in 2007 and 10,000 a year in the 1990s. As many as 6,000 people were put to death in 2010. By comparison, according to Amnesty, the country with the next-highest recorded rate of executions in 2010 was Iran, with 252, followed by North Korea with 60, Yemen with 53 and the United States with 46. Death penalty numbers are derived from press reports. Many human rights believe the real number of executions is much higher. Information on executions is a carefully guarded state secret. Dui Hua’s Joshua Rosenzweig told AFP, “There are a number of problems and uncertainties in the way the death penalty process is carried out. One of the major problems is that it is a very untransparent system.” In March 2010, Amnesty International slammed the Chinese government for not revealing the true number of people executed each year. According to Amnesty International there were 470 executions in China in 2007, the most of any country in the world but way down from previous years. Many see the drop as temporary and a result of new rules on judicial reviews and teh fact that China wants to look good with the Olympics coming up. China has cut back on executions and execution are no longer carried out as swiftly as they were before since China’s highest court was given authority to review death penalty cases in early 2007. According to one human rights group the number of executions in China has dropped 40 percent since Beijing was awarded the Olympics in 2001. 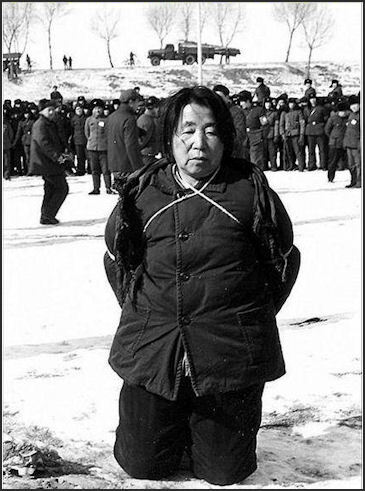 Wang Shouxin Execution in 1980 Amnesty International estimated there were at least 1,770 executions in 2005, 80 percent of the world’s total that year. Many believe the true figure is much higher, perhaps around 8,000 or even 10,000. The Chinese don’t release any statistics on executions. Amnesty International comes up with its number from publicized cases. An internal document quoted in a book about the Chinese leadership reported about 15,000 executions a year between 1998 and 2001. In 2003, according to Amnesty International, at least 5,000 people were executed, or 90 percent of all the world’s executions that year. In 2002, there were 1,060 documented executions in China. In 2001, a total of 2,468 of the 3,048 documented executions worldwide were in China, 139 were in Iran, 79 were in Saudi Arabia and 66 were in the United States. These four countries accounted for 90 percent of all executions, with China accounting for 80 percent. In 1996, a year in another "Strike Hard" ant-crime campaign was aggressively carried out, there were 4,367 (a dozen a day) confirmed executions. More than 1,000 people were executed in the first two months alone and 222 people were executed in a massive one-day crackdown on drug trafficking. On World Anti-Drugs Day on June 26, 769 of the 1,725 people sentenced on drugs charges were given the death penalty. In 1997, 2,700 people executed; 2,050 were executed in 1994, 1,411 were executed in 1993 and 1,079 were executed in 1992. Between 1983 and 1986, the early years of the Deng reforms, some 10,000 people were executed. In 1995, according to Amnesty International the were 2,190 executions in China, compared to 192 in Saudi Arabia, 95 in Nigeria, 56 in the United States, 50 in Singapore, 47 in Iran, 41 in Yemen, 28 in Russia, 19 in South Korea, 16 in Taiwan and 12 in Jordan. The majority of executions are for murder, robbery, intentional injury and drug trafficking. Wang Shouxin Execution in 1980 In August 2009, China’s Supreme Court said the death penalty needed to be used more sparingly and should be reserved for only the most serious cases. In February 2010, China’s top court issued instructions to lower courts to limit the use of the death penalty to a small number of “extremely serious” cases. In September 2007. China’s top court order judges to use the death penalty more sparingly and show more mercy to criminals that cooperate with authorities. A law that went into effect on January 1, 2007 gave China’s highest court---the Supreme People’ Court---the authority to review the death penalty. Before then the final say was in the hands of provincial courts. The law was enacted in part because of complaints about arbitrary decisions and miscarriages of justice involving capital punishment on the local level. In the early 2000s, high courts were ordered to review all death-penalty cases before the executions were carried out. Before only a small number of cases were reviewed by the high courts. Most were only reviewed by local courts. Some cases have been overturned, including that of a farmer in Anhui who was sentenced to death for the murder of another farmer based on confessions the farmer said was acquired through torture. In 2004, there was a discussion of reforming the justice system to reduce the number of death sentences given out. The reforms were supported by many in the central government and justice system but opposed by many local officials and police. The issue was addressed partly as a result of growing discontent with the judicial system and law enforcement, which had increasingly been viewed as corrupt, unfair and overly harsh. The reforms were seen by some as a way for the central government to address concerns by ordinary Chinese without relinquishing their control of the courts. 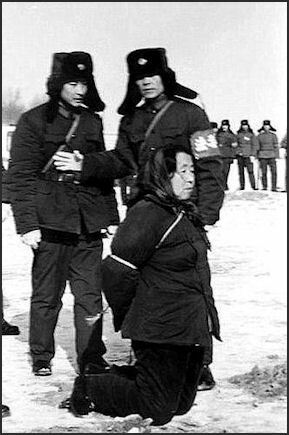 Wang Shouxin Execution in 1980 According to Amnesty International there are 68 crimes punishable by death in China, or about a forth of all criminal offenses in China, are punishable by death, up from 32 in 1980. Among those that face the death penalty are pimps, embezzlers, livestock rustlers, tax receipts forgers, drunk drivers, credit card thieves, bicycle thieves, bribe takers, arsonists, drug dealers, spies, thieves, prostitutes, cultural relic traders, dike saboteurs and organizers of secret religious groups. In recent years, the group, says people in China has been put to death for tax fraud, stealing VAT receipts, damaging electric power facilities, selling counterfeit medicine, embezzlement, accepting bribes and drug offenses. Of the 68 crimes, 44 do not involve violence. People have been executed for tax fraud, embezzling money and even petty theft. In December 2004, two Hong Kong men were sentenced to death for smuggling digital player components into southern China. In April 2006, death sentences were given to cooking oil smugglers that bribed customs officials and evaded $300 million in tariffs. In 1992 a merchant was executed for trademark for infringement because he labeled ordinary moonshine as Maotai, a powerful and popular Chinese liquor. In 1996, a peasant was executed for selling the head for a Buddha statue he found on the ground for $36. In 1997, two peasants in Yunnan were executed for stealing runway lights from the airport in Kunming. In 2001, a 19-year-old was executed for stealing the 60 yuan ($7) and another man was executed for stealing ball point pens and badminton rackets. Death sentences are arbitrarily meted out with the rules often varying from place to place. Sometimes people are executed for things like prostitution and smuggling, which are largely tolerated in most places in China. In July 2010, the National People's Congress began considering amending the criminal code. Reforms were said to include reducing from 68 the number of crimes punishable by death, as well as the age at which convicted criminals can be executed. If such reforms are enacted, nonviolent crimes in China will, for the most part, be exempted from the death penalty. The proposals are part of a movement aimed at reining in the indiscriminate use of the death penalty. In the mid 2000s, the Chinese government was considering scraping the death penalty for some non-violent crimes so that corrupt officials that had fled abroad could be more easily extradited. As its stands now many foreign governments refuse to extradite suspects to China out of concerns their human rights will be denied and they will be executed. The legal experts said the government’s changing attitude toward capital punishment may reflect sensitivity to international criticism---and in this case, unlike criticism of its politics or economic policies, in an area that does not touch on the core ideology of the ruling Communist Party. The first to benefit under the suspension rule was Hou Qinzhi, a fruit vendor in Nanjing who had his scale seized in August by a city government inspector. The vendor wrestled with the inspector and ended up stabbing him with his fruit knife. He was sentenced to death, but last month the execution was suspended for two years. But in another high-profile case, public opinion has taken the opposite view. Xia Junfeng was a laid-off worker who sold kebabs from a cart in Shenyang, in China’s northeast. He was convicted of killing two city security guards in 2009 when they confronted him over his unlicensed cart; Xia asserts he acted in self-defense, when the city officials began to beat him. Xia has attracted enormous sympathy around the country as a poor man set upon by local officials. He was sentenced to death, but his lawyers are asking the Supreme Court to spare his life, and the final decision is pending. Public executions still occur. The Washington Post reported that after the attacks before th Olympics in 2008 the local government inYengishahar county in Xinjiang bused several thousand students and office workers into a public square and lined them up in front of a vocational school to watch the execution of three prisoners, who been convicted on terrorist charges in connections with a plot by the East Turkestan Islamic Movement to disrupt the Olympics. Recalling what he witnessed while traveling through the countryside outside Guangzhou in the summer of 1983, John Kamm wrote Washington Post: “As I passed through a small town, a man and his two sons, each tilting forward from the weight of the large white boards strapped to their backs, were driven past, en route to an execution ground. The boards proclaimed their death sentences; the men's arms were tied behind them. I remember the elder screaming his innocence as a throng of feral youth rushed ahead to get in position to witness the shootings. Farther up the road I encountered another execution scene, this time in a sports stadium with a throng of enthusiastic onlookers. 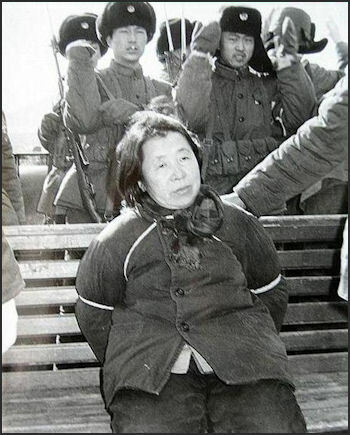 In the late 2000s there was an Internet fascination with a series of photos from 1980 chronicling the execution of Wang Shouxin, a corrupt female government official from Heilongjiang province and the subject of Liu Binyan's reportage “People or Monsters.” According to Xinhua she and others were arrested in April 1979 for the crimes of sharing illegal profits and then hiding and covering up the loot. She was sentenced to death on February 28, 1980, paraded in a public meeting and taken in a truck to a field and shot as a crowd looked on. Wang reportedly embezzled several hundred thousand RMB. According to the People’s Daily: “You can call her a “corrupt official” but she is a merely a manager of a combustible fuel company. Nobody knows what the rank might be in the hierarchy of officialdom but it is probably the lowest possible.” In the late 2000s, the process of her execution was published by the photographer at the scene and then broadly circulated on the Internet. Within a few days after being posted on Sohu.com. they had been seen by 1.132 million persons. 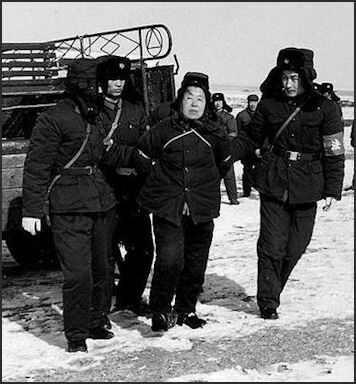 Another series of photos entitled Mao Zedong Personally Signed the Approval to Execute Seven Criminals has also been popular on the Internet recently. Death penalty justice can be very quick. In November 2004, a 21-year-old man was caught after he broke into a high school dormitory and stabbed nine Chinese boys to death in the city of Fuzhou in the central province of Henan. Within two months he was tried, sentenced to death and executed. By contrast prisoners on death row in the United States wait for years before they are executed. In Japan the wait can be more than ten years. Some courts sentence people to death within only a few days after they are arrested. Amnesty International reported one case that began with three men allegedly stealing a car filled with banknotes on May 21. On May 24, they were arrested; on May 27 they were sentenced to death; On May 28 their appeal was rejected; on May 31 they were executed. In another case a man was executed for murder six days after he committed the crime. Verdicts are usually foreordained. Victims are sometimes sentenced in public rallies or paraded through the streets on the back of flatbed trucks after sentence. Sometimes tens of thousands, or even hundreds of thousands, of people gather in town squares and stadiums and cheer the verdicts at "mass sentencing rallies," which are also commonly shown on the television news. The executions themselves are not usually viewed by the public. Prisoners are often lead away to vacant fields and executed in neat rows when the rally is over. Photographs of prisoners who have received the death penalty are posted at railroad stations and post offices. After they have been executed a red mark is placed next to the prisoner's name. Executions often take place immediately after the final appeal. If a suspect receives a death sentence and then is given a two year reprieve that usually means their sentence will commuted to life in prison. When a whistle is blown a soldier fires a bullet from a carbine rifle’selected for its large bullets---into the back of the skull where spinal cord joins the brain. Even though the soldiers fire from point blank range, they sometimes miss. If this occurs another bullet is fired. Both women and men are executed in this fashion. Many executions are performed at the Beijing Supreme People's Court 86, located on an arid hill overlooking the capital. "Under an open sky," Lena H. Sun wrote in the Washington Post, "the prisoners, arms tied behind their backs, their legs in shackles, kneel on the black earth. At the signal, a paramilitary soldier fires a single rifle shot. It is usually to the back of the head”. What was unusual was the intense public soul-searching the case also unleashed. Many legal professionals and others openly questioned whether justice was served by executing a young man who voluntarily turned himself in and confessed, and whose family offered to pay compensation. His crime touched a nerve here---a young man of privilege who killed a poor woman on a bicycle---but many blamed an online mob mentality for forcing a supposedly dispassionate court into imposing a death sentence. When Yao was on trial, several lawyers declared publicly that he should be spared the death penalty. Li Fenfei, a law professor at Remnin University, wrote a blog post arguing that Yao had turned himself in, that he had acted in the heat of the moment and had not planned to kill the bicyclist. Also, Li said, “he’s quite young, in his 20s. In China, we believe young people can make a mistake.” But after his blog post appeared, Li was bombarded with rude and threatening comments. “You mean that if you have money you have the right to kill? So where do you live?---one anonymous commenter wrote. execution People found guilty of trafficking amphetamines or caught smuggling more than 50 grams of heroin and/or 1,000 grams of opium face the death penalty. Some of those are spared the death penalty are sent to re-education camps or given long prison sentences. Drug traffickers are routinely executed. International Anti-Drugs Day on June 26 is popular time to execute people for drug-related crimes. In 2001 and 2002, 43 and 64 people respectively were executed in anti-drug day rallies on that day. IIn 1995, 22 drug traffickers were shot to death in a single public execution in Mangshi, near the Myanmar border. In 1994, courts ordered 466 executions for 6,000 drug-related arrests. On International Anti-Drugs Day in 1996 1,725 people were convicted on drugs charges. Of these 769 were sentenced to death. In the first six months of 2001, 1,457 people were executed on drug charges. Global anti-drug day in June 2009 was marked with the execution of at least 20 people, the condemnation of around the same number and putting hundreds on trial. Among those executed was a Nigerian man caught with six kilograms of heroin and a Chinese man caught smuggling 197 grams of methamphetamines from North Korea. In Xinjiang authorities destroyed six tons if heroin, opium and cannabis smuggled in from Afghanistan and Pakistan. Foreign nationals caught with drugs in China are not spared. In 2004, a Japanese man in his 60s was caught trying to smuggle 1.25 kilograms of stimulant drugs out of China into Japan. He was caught at Shenyang’s airport as he prepared to board a plane to Osaka. He pleaded not guilty but was sentenced to death in 2006. Two other Japanese convicted drug smuggling have been given death sentences. The widow of an executed man who occasionally smoked heroin in cigarettes and later was recruited to carry heroin told the New York Times, "Our family was always poor and a guy from the Fujian province said to my husband that he would give him a lot of money if he would transport drugs. Our daughter was very sick and we needed money badly." His last words were "take care of our daughter and try to avoid heavy work in the fields." The executions haven’t been much of a deterrent. Many dealers can bribe their way out of trouble if they get caught or purchase protection from Communist Party officials, PLA soldiers or the police. The execution and crackdowns have also had little effect on the drug trade. executed girls In December 2009, a British man, Akmal Shaikh, was executed on drugs charges. The first European citizen to be executed China in more than half a century, he was arrested in 2007 for carrying in suitcase with almost four kilograms of heroin on a flight from Tajikistan to China. He told police he did not know about the drugs and the suitcase was not his according to Reprieve, a London-based prisoner advocacy group. In December 2009, four foreigners were arrested along with five Chinese in connection with the seizure of 144.5 kilograms of heroin found in 289 bags hidden in bales of cotton in Shenzhen. The drugs had come from Pakistan and were found with the help of a tip and tracker dogs. The four foreigners might face execution. 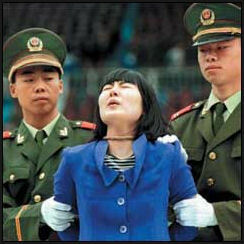 In April 2010, four Japanese men convicted of drug smuggling charges in China were executed. All four men were caught trying to smuggle or sell more than one kilogram of illegal drugs---in most cases, amphetamines. They included 65-year-old Mitsunobu Akano who was caught with 2.5 kilograms of methamphetamine as he tried to board a plane to Japan at China’s Dalian airport in September 2006. In China, people caught smuggling over one kilogram of drugs are often executed. The executions marked the first time that Japanese nationals were executed in Japan since China and Japan normalized diplomatic relations in 1972. The Chinese government went somewhat out of its way to make sure the executions did not harm Japan - China relations. Akano was allowed to meet with his family before he was executed, which normally is not done. All the Japanese are believed to have been killed by lethal injection. China executes British drug smuggler After the execution the body is photographed. If no organs are to be removed the body is taken away to a crematoria. The family of the prisoner is not allowed to see the corpse but they do have to pay the costs of cremation and transport to the crematoria. Recently execution sites have been moved to remote locations partly because too many prisoners were yelling anti-government slogans before they were killed. According to a 1986 regulation: "Execution grounds are not allowed to be set up near busy sections of town, near key roads or near tourist sites." Organs, corneas and skin used in transplant operations are often taken from executed prisoners. Sometimes the organs are removed in the ambulance two or three minutes after an execution take place. It is not uncommon for prisoners to receive and anti-coagulant hours before the execution to make organs transplants easier. Afterwards the body is taken to crematoria where skin and corneas are removed and the body is quickly cremated, which destroys any evidence that the organs had been removed. The reliance on prisoners for organs is the result of a scarcity of donors partly resulting from the deep-seated cultural taboo against damaging the integrity of the body. Chinese rarely give doctors permission to take organs from deceased family members. Executed prisoners are treated with different standard. The organs are usually removed without the prior consent of the prisoners or their families. Permission from family members for organs taken from executed prisoners is rarely asked for or given. organ harvesting Organ harvesting from executed prisoners has been going on for some time. In 1991, according to the People’s Daily, 2,900 kidneys from executed criminals were transplanted into patients. Hong Kong patients who need kidneys were referred to a medical center run by Guangzhou University if they had enough money. One physician there said he welcomed criminal activity and an increased number of execution to supply the transplant market. An official report obtained by Human Rights Watch\Asia read: "the use of the corpses or organs of executed criminals must be kept strictly secret. Attention must be paid to [avoiding negative] repercussions." Other countries harvest organs from executed prisoners. Taiwan does but reportedly does so with the consent of the prisoners. Beijing said on several occasions that allegations that organs were harvested from prisoners were “vicious slander” and “sensational lies.” Finally in 2005, the Chinese government fessed up and admitted for the first that organs were harvested from executed criminals and said it would regulate the trade. Before then the only laws on the books was a 1984 draft document that stipulated that operations for harvesting organs can only take place with the consent of the prisoner’s family or if the body has not been claimed. In July 2006 a law went into affect that specifically bans the sale of human organs. The law requires that donors give written permission for their organs to be transplanted and restricts transplant surgery to top-ranked institutions that must verify that organs are from legal sources and that surgery is safe and justified. An August 2009 Ministry of Health statement acknowledged that 65 percent of the 10,000 transplants in China involved organs from executed prisoners. “There is zero guarantee that consent was involved,” Gutmann said. “Ample evidence has come to light that the victims could well have been Uyghur Muslims, Tibetan Buddhists, “Eastern Lightning” Christians or---exponentially more likely---Falun Gong practitioners. In other words, Wang Lijun received an award for, at best, barbarism.” It is not possible to know what proportion of victims Wang referred to in his remark about “thousands” of on-site transplants were criminal prisoners and how many were political prisoners or prisoners of conscience, such as Falun Gong practitioners. Further, in China there is a range of nonviolent crimes that can be punished with the death penalty, but the communist state does not publish statistics detailing the numbers of people executed and their crimes. In the eyes of experts, a significant question left worryingly open in Wang’s remarks is whether the prisoners actually died before their organs were taken from their bodies. Given the reference to drug injections, it is highly possible that the hearts of the victims were still beating when their organs were removed, these experts say. Wang’s conversations with the U.S. consular officials in Chengdu might shed light on such details as the function of the drugs he used in transplantation operations in Liaoning Province. In any case Wang’s visit to the consulate provides the best opportunity to date of confirmation from a Chinese official of the ongoing practice of forced organ harvesting in China. At a press conference on Monday in Washington, D.C., Falun Gong spokesperson Dr. Tsuwei Huang called on the U.S. government to release the contents of Wang Lijun’s conversations. organ harvesting One medical official told The Times of London that hospitals contact local police and make requests for organs. Later, the police notify them if donors are available. 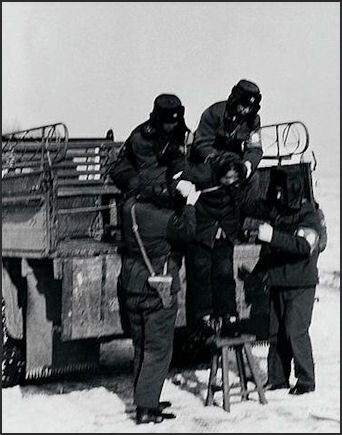 Doctors then travel to execution grounds in specially equipped ambulances with a team of nurses to harvest the organs as quickly after death as possible. An exiled Chinese doctor, Dr. Wang Guoqi, described the harvesting of organs from prisoners before a U.S. Congressional Committee. He said he participated in the removing of skin and corneas from 100 execution victims, including one who was still alive, at the Tianjin Paramilitary Police General Brigade Hospital. Dr. Wang told the Washington Post, security officials are paid $37 a corpse to tip off the hospital that executions were imminent. Removing the skin, he said, took 20 minutes or less. "A circumferential cut was made around the wrist, the neck and the shoulder joint as deep as the subcutaneous fat layer or the layer above the muscles. A longitudinal cut was made on the inner side of the upper limb linking both circumferential cuts, either from top to bottom or in the opposite direction." "After all extractable tissues and organs were taken, what remained was an ugly heap of muscles, the blood vessels still bleeding, all viscera exposed." The skin was processed and chilled for transplants recipients, mostly burn victims, who are charged about $12 for 10 square centimeters of skin. Wang said he was told to work on a man who was not killed by the bullet to the head and was convulsing on the ground. Doctors were ordered to extract the organs and remove the skin and told the removal of the organs would kill him. selling prisoner organs Wealthy Thais, Filipinos, Russians, Indians, Indonesians, Malaysians and Taiwanese with serious kidneys aliments sometimes travel to China to receive transplanted kidneys taken from executed prisoners. According to AFP the desperate patients pay up to $40,000 for operations performed by unscrupulous and in many cases unqualified doctors. Agents who arrange the operations make huge profits while the patents only have about a 40 percent chance of survival. The prisoners are often killed in batched. In some cases patients are told in advance when batches of prisoners are going to be killed and waiting in hospitals in anticipation of organs being made available. Potential recipients are often told to be ready around the Chinese Lunar New Year because many executions tale place around that time. A Malaysian man who underwent a kidney transplant in a hospital in Guangzhou told the International Herald Tribune:, “They just tell you it was a convict. They don’t tell you what he did.” But often they were “young men” who commit “serious,” “violent” crimes. “The pledge to abolish organ donations from condemned prisoners represents the resolve of the government," Xinhua quoted Mr. Huang as saying.